Local shares continued the new year rally yesterday with investors focusing on a positive earnings season so far instead of the United States government shutdown. After opening at 3,551.96, the key Straits Times Index (STI) headed north to close at 3,569.43, up 0.54 per cent, or 19.07 points. More than 1.8 billion shares worth $1.4 billion were traded with gainers outpacing losers 247 to 177. Analysts see minimal impact on the US economy from a short-term shutdown but warned that a prolonged stalemate in Washington could dampen confidence in US assets. "The markets had not expected this shutdown. Given that US share prices have rallied strongly since the beginning of the year, we have to see if this event is a trigger to change the market trend," Mr Takafumi Yamawaki, head of Japan fixed income research at JPMorgan Securities, told Reuters. He noted that during previous government shutdowns, US bond yields tended to slip in the first few weeks after the closure. But so far, US Treasuries yields have risen. Talk of a white knight sent commodities trader Noble Group soaring 6.5 cents, or 31.7 per cent, to 27 cents. Sembcorp Marine continued to generate investor interest here. The marine services provider, which rose nearly 20 per cent last week, is the subject of much speculation, including a potential privatisation or divestment by Sembcorp Industries and expectations that it will not be fined over its Brazil operations as Keppel Corp was. OCBC Investment Research said if an offer for SembMarine does materialise, there could still be some upside supposing the price offered is higher, which is typically the case to entice shareholders to bite. "Assuming a 20 per cent premium from current levels, this would translate to about $2.76 a share," it said. SembMarine advanced nine cents to $2.39 with more than 31 million shares changing hands. 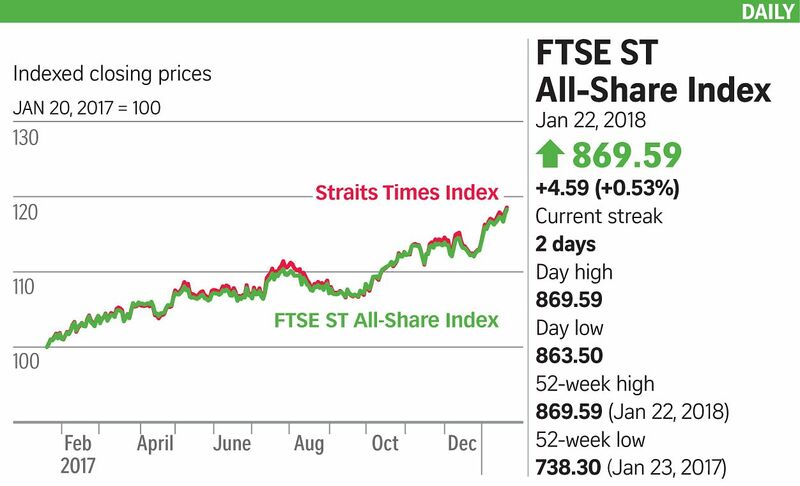 Singapore Exchange (SGX) was another winner; analysts upgraded the bourse to a buy after it approved the primary listing of companies with dual-class share structures. It is also looking to issue $1 billion to $2 billion in debt for acquisitions. DBS Group Research said that it expects SGX's earnings to grow by 4 to 11 per cent, after a relatively weak 2017. It raised its target price on SGX from $8.40 to $8.90. "SGX's continued efforts to drive market liquidity and new product initiatives should bear fruit in the coming years," it noted. SGX added 37 cents, or 4.64 per cent, to $8.35. Elsewhere, Hong Kong shares rose 0.43 per cent.